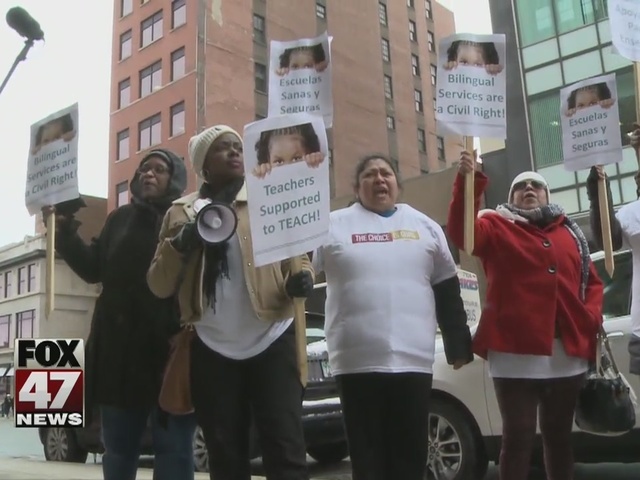 Parents fed up with conditions in Detroit Public Schools are ready to get something done about it with dozens protesting in Lansing on Tuesday. Protesters are asking lawmakers to approve funding to bail the district out of debt. "Kids come first. If they had that into consideration from the beginning we wouldn't have this problem now," said parent Cynde Reyna-Garza. Reyna-Garza says consistency is a problem in her 8-year-old son's school because there's a revolving door of teachers. She says getting full-time teachers in the classroom isn't easy. "It's February and they still have substitute teachers in the classroom giving class," Reyna-Garza said. "You gotta think, do you want your child in there? Having a different teacher every time?" She pins the problem on poor working conditions and other parents agree. "We want teachers who don't have to go into their pocket, into their meager salaries and spend their money to get what our kids deserve -- that we already pay for," said one of the protesters. With the district facing a debt that a state-appointed team of researchers estimates at $3.5 billion, getting the funding to improve that could fall on taxpayers. "I think we have an obligation to make sure every kid has good education no matter where they live," said Sen. Jim Ananich (D-Flint). Lawmakers are considering a bill that would give more than $700 million to the district, but Ananich says that doesn't go far enough. "To allow this to happen for this long period of time and to allow conditions to get so bad, it's just deplorable and it's unacceptable," he added. State Treasurer Nick Khouri testified to a senate committee considering the bills. He said bailing out the district would be cheaper than letting it go into bankruptcy which he estimates could cost up to $100 million. But Reyna-Garza's says the state's inaction does not help, meaning her son isn't getting a quality education. "Not a regular curriculum, sharing books, you know it's a shame," she added.